Why Some Schools Want To Expel Suspensions Research shows suspensions are disproportionately applied to minorities and give students a fast track to dropping out and to the juvenile justice system. The Los Angeles Unified School District recently instituted a ban on certain suspensions, but finding a viable alternative is a complex task. 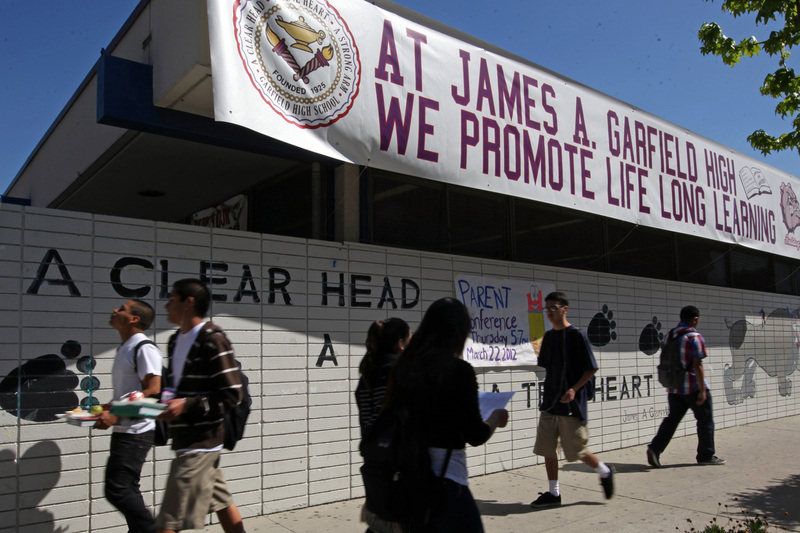 When Garfield High School in Los Angeles stopped suspending students for "willful defiance" several years ago. Tuesday, the Los Angeles Unified School District board voted to follow suit in all Los Angeles schools. The effectiveness of school suspensions is up for debate. California is the most recent battleground, but a pattern of uneven application and negative outcomes is apparent across the country. California students were suspended more than 700,000 times over the 2011-2012 school year, according to state data. One school district decided it was getting ridiculous. In May, the board for the Los Angeles Unified School District passed a new resolution to ban the use of suspensions to punish students for "willful defiance." Those offenses include: bringing a cellphone to school, public displays of affection, truancy or repeated tardiness. They accounted for nearly half of all suspensions issued in California last year. But there's mounting research that says that out-of-school suspensions put students on the fast track to falling behind, dropping out, and going to jail. Moreover, some groups are disproportionately suspended more than others. Damien Valentine, now 16, received his first out-of-school suspension for repeatedly talking to another student in class and talking back to his teacher. That was four years ago at John Muir Middle School in South Central Los Angeles. Subsequently, the suspensions kept coming. In eighth grade, Damien had a few "confrontations" — not fights, he says, just some heated words between students. But he got suspended again. Then, his freshman year of high school, he was suspended from campus for three weeks, accused of helping to start a gang. Damien says he believes teachers and principals have an unspoken way of seeing boys and girls of color. "As soon as you go inside the class and get in trouble, they say they already expected it," he says. "They already expected for this African-American male to act like that." In the 2008 school year at John Muir, black students received half of the total suspensions, though they made up 23 percent of the student body. That pattern extends beyond Los Angeles, says lawyer and educator Daniel Losen, who directs the Civil Rights Project at the University of California, Los Angeles. In April, Losen co-authored the report, "Out of School and Off Track," which found skewed suspension rates for certain demographics. "As we've gotten to this sort of zero-tolerance mentality, that kind of policy has been especially applied to poor kids and especially black kids; and also, kids with disabilities," he says. Losen notes that even being suspended once doubles the chance a student will drop out, raising the risk to 32 percent from 16 percent [which is the dropout rate for students who are not suspended]. Suspended two or more times? The dropout rate is 49 percent. "All the research says that [being suspended] contributes to their disengagement from school," he says. "So you can imagine that for poor students, students from single-parent households or kids who are homeless, they're much more likely to wind up on the streets unsupervised." In addition to being more likely to drop out, suspended students also have a higher likelihood of falling into the juvenile justice system. "That brings up another really important issue: The costs of suspending students are really sky high, but they're hidden costs," Losen says. But Los Angeles teacher Martha Infante says she does not believe eliminating suspensions is the right move for her school district. "If I see the classroom environment is suffering, that the students are getting scared, I will remove the problem student because my other students have rights, too," she says. She teaches at Los Angeles Academy Middle School. Infante, who has taught for 16 years, says she believes her ability to suspend disruptive students is an important tool to maintain control of her classroom. "The more time you spend on discipline issues, it affects the classroom environment," she says. "And sometimes, it doesn't matter how much time I take. It ends up not making a difference, and there's no change in behavior." Infante says she doesn't hand out suspensions willy-nilly, and often just the threat of a suspension can be effective. Otherwise, she says, "You offer counseling, you get services, whatever services are available." The problem is, in this era of budget cuts, counselors and psychiatric social workers are in short supply. At Garfield High School, there's no more money for counselors and social workers — and there are few suspensions. Principal Jose Huerta says he has a found a third way. "It's simple. It doesn't cost money. It's just connecting with kids and having a strong instructional program," he says. The year before Huerta took over as principal, there were 683 suspensions. Heurta says suspending students had become a reflex to poor behavior. But when he took over in 2010, he said, "No more." The results have been dramatic: just two suspensions in the past three years. "I didn't come into Garfield saying, 'OK, my mission in life is to lower suspensions.' It wasn't. It was to enhance and improve the instruction," he says. "And because we did, we were successful with a great teacher group, a great administrative staff, great parents." When a student does act out in class, Huerta says the teachers act quickly with counselors or the student support team to "find out what the real deal is." "Ninety percent of the time, we find out something happened the night before," he says. Issues at home could range from divorce, to a death or even a family member being deported. "But these are teenagers. They're not going to go and cry to anybody, they're [in] a tough neighborhood," he says. "So when that kid acts out, we get in his face immediately. ... And we resolve it. And you know what? These kids respond well. Their needs were met." Since there's no money for additional professionals, Huerta has substituted with parents and nonprofit community groups. He says he believes everyone needs to be accountable: students, parents, teachers and the local community. Across town in South Central LA, Damien is about to finish his sophomore year of high school. That three-week suspension for alleged gang activities made him believe he didn't have a future at that school, so he took action and transferred. He says he told himself, "All right, this is a new start." It has been a new start. At Manual Arts High, he's been able to stay out of trouble. And at the LA Unified School Board Meeting where the decision to curtail suspensions was made, Damien testified about how suspensions almost pushed him out of the school system altogether. He's proud he was a part of the process of changing the district's suspension policy.